Clawmark Toys has done it again and found one more of this rare figure. THIS IS THE ALMOST IMPOSSIBLE TO FIND GREEN ORGA! 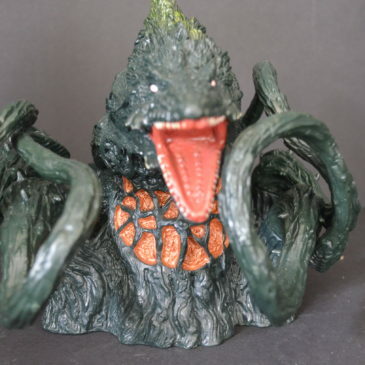 This is the nasty looking Alien beast that was Godzilla’s foe in the movie Godzilla Millennium 2000. 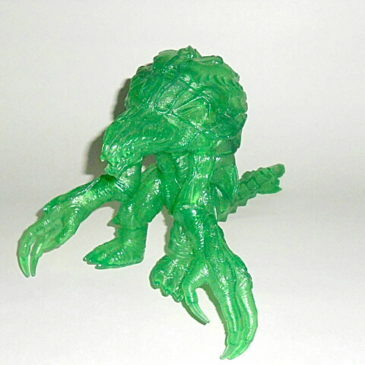 Articulated at the arms, legs and tail, it stands approximately 6 inches tall. GREAT CLAWS!! 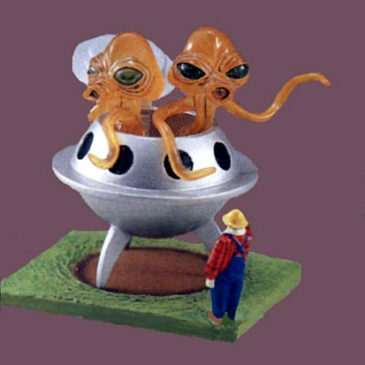 THIS FIGURE WAS A PRIZE THAT WAS GIVEN IN A CONTEST IN “TELEBE KUN” MAGAZINE in 2000. THEY ONLY PRODUCED 10 OF THESE FIGURES! THAT IS RIGHT, THEY ONLY PRODUCED 10 OF THESE FIGURES! 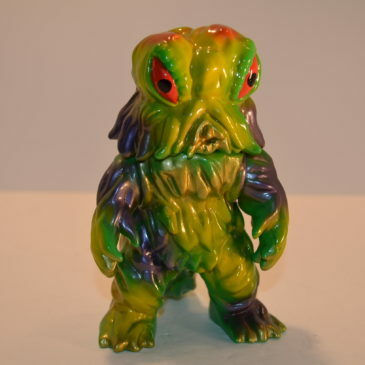 the green Orga figure was a myth to many until it was brought to light for American Collectors at the last G Fest by Clawmark Toys. IT IS THE REAL DEAL!! I’ve been fortunate enough to find two this IMPOSSIBLY RARE FIGURE. T WOULD MAKE THE CENTER PIECE FOR ANY VERY SERIOUS COLLECTION. THIS IS THE REAL DEAL AND IT IS MINT. The figure was made without a tag, but has all the Bandai information on the figure it’s self. 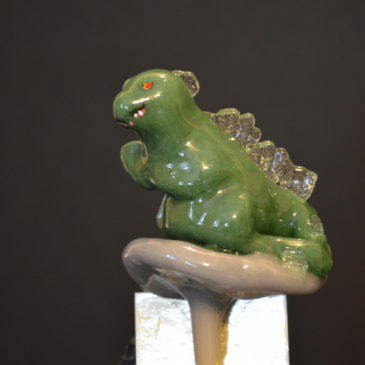 Own a piece to Gamera toy history. 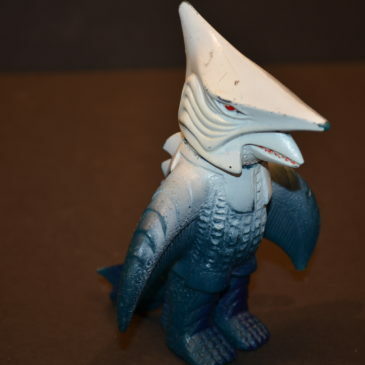 Here is Zigra the part shark, part hair comb, part bird monster who menaced the world in the 1971 Daiei movie Gamera vs Zigra. 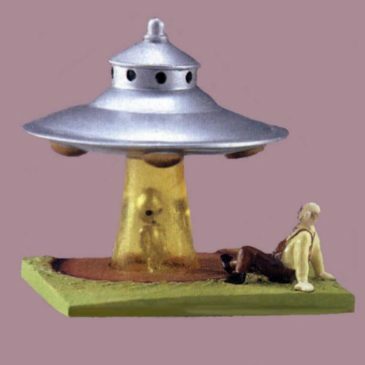 This original vintage 1971 toy was made by Nitto. He is the small version standing about 4 3/4 inches and made of dark aqua blue vinyl. He has white sprays on his head to his shoulders. He is articulated at the neck. His condition is excellent to very good. There are paint rubs and scratches on head and tips. Here is Rare Red version of the Marmit Vinyl Paradise Edition of Pulgasari. Pulgasari the giant water bull protector of the innocent. He stands 10 inches tall in all his magnificent redness! Marmit made 3 version of Pulgasari, Black, Red and the Gold theater edition. He comes mint with header. ONE of a KIND, Yuji Nishimura the owner of M1 was asked by the owner of Charactics Monsters to create the paint art for two different styles of Hedorahs and Biollante. This is Sample Number 3 of the Hedorah one offs that Nishimura created in 2006. Clawmark Toys found these on our last trip to Tokyo. Hedorah stands 6 inches tall and is expertly painted on Green Vinyl in glossy shades of yellow, purple and gold. 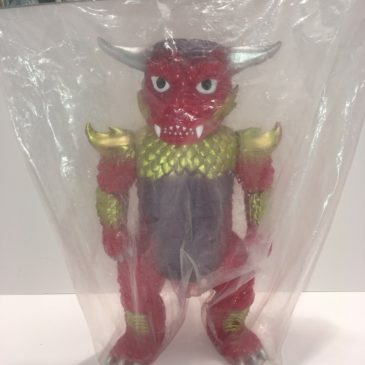 Own a piece of Kaiju history! ONE of a KIND, Yuji Nishimura the owner of M1 was asked by the owner of Charactics Monsters to create the paint art for two different styles of Hedorahs and Biollante. This is Sample Number 9 of the Hedorah one offs that Nishimura created in 2006. Clawmark Toys found these on our last trip to Tokyo. Hedorah stands 7 inches tall and is expertly painted on Green Vinyl in glossy shades of yellow, burgundy, black and gold. 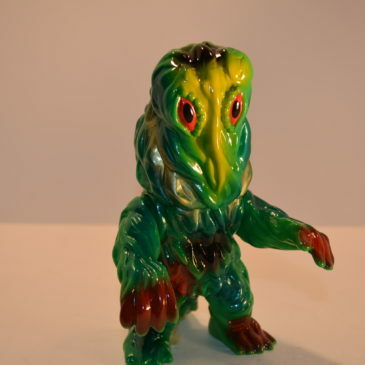 Own a piece of Kaiju history! This is from the RARE First Collect Club series produced in 2002 . Each Collect Club figure is polyvinyl resin and beautifully detailed. They are approximately 3-4 inches high. They require assembly. This is from the RARE First Collect Club series produced in 2002 Each Collect Club figure is polyvinyl resin and beautifully detailed. They are approximately 3-4 inches high. They require assembly. This collection produced by Medicom Toy, Japan is truly fantastic. This series is out of production since 2001. 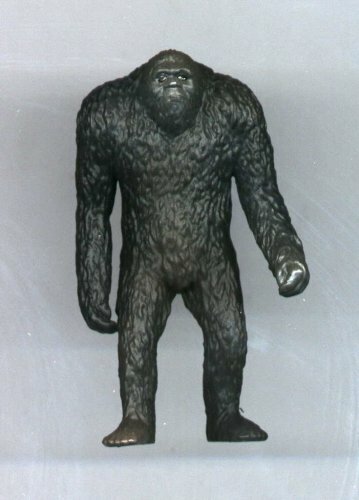 This is one of the RARER figures: The bigfoot another witness. It comes with its original card, paper insert and box. There are currently FOUR parts to this series of amazing figures.